Metro State students can now browse their D2L courses through the Brightspace Pulse app using Android and iOS devices. Released in mid-2015, Pulse supports the D2L platform at Metro State and the other colleges and universities in the Minnesota State system. Faculty have not yet been trained on using the Pulse app, according to Bob Bilyk, director of the Center for Online Learning. After faculty training is completed in the new academic year, students will hear more about how to utilize the app, Bilyk said. With the tagline of “less time organizing and more time learning”, the Brightspace Pulse app offers students a simplified way to browse D2L course contents, grades, deadlines and updates on their mobile phones. To see what Brightspace Pulse has to offer, download it from the app store. Select Metropolitan State University under “Pick Your School.” Enter your StarID and password to log in to the app. As of now, the app is mostly geared toward viewing content. There are three main sections: calendar, courses and notifications. Select a course from the courses section to view contents like syllabus, slides and chapter notes. With the app, you can open your D2L course content with a maximum of 3 clicks. That saves time compared to using a mobile or desktop browser to access D2L. The courses section also offers a filter to view contents by type and course. It includes a default content reader so you don’t have to move into another content reader app. The calendar section displays the course schedule for all your enrolled courses. By selecting the day or week, you can view all your due dates so you can plan accordingly. In the deadlines section, you can go to the assignment submission page with just a click and submit your work. You can also mark assignments as completed which offers a sense of control and achievement. 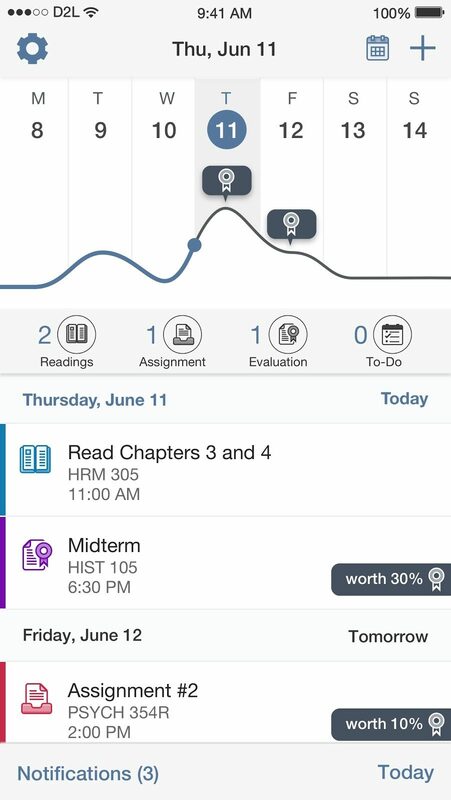 Additional app features include adding user-created custom assignment and reading due dates. You also receive real-time notifications of any updates on course contents, grades and subscribed discussion posts. The grade viewer lets you swipe to reveal your grades. You can view and write comments in the discussion forum too. But to view a discussion post, you must be subscribed to it so that you receive notifications.